Swim Rotorua took a team of six to the New Zealand Short Course Championships on the North Shore. 4m 28.55s to claim fifth spot. His other top 10 placings came in the 200m freestyle (9th) and the 200m butterfly (6th). David Boles took on a monster programme comprising 10 individual events and four relay races. Despite his daunting schedule, he went through to six finals and achieved best times in every individual event bar one. His top performance came in the 200m backstroke where he stormed home to win the B final with a new best time of 2m 4.17s which was a new 18 years and open Bay of Plenty record. His other top 10 age group successes came in the 400m medley (9th), 800m freestyle (6th), 400m freestyle (10th), 200m butterfly (10th) and 1500m freestyle (7th). Annelyse Cowie showed off her new breaststroke style and turn skills to make it through to the C final in her signature 200m race. Her time of 2m 45.28s was a four second drop which secured her sixth place. She produced another best time in the 100m breaststroke, finishing 10th. In the 400m medley, Annelyse was seventh place with another best time of 5m 25.07s. James Baldwin impressed in the freestyle sprint events to claim top 10 finishes in the 50m and 100m races. He finished strongly in his favourite 50m freestyle to place sixth with a new best time of 24.42s. His time in the 100m was another good improvement to record a new best time of 54.17s and place ninth in his age group. Rocco Marsh marked his debut at the short course championships with a fine series of racing. His best performance came in the 100m freestyle where his time of 54.23s was good enough for his first national top 10 placing. Other notable improvements came in the 50m and 100m backstroke, with the latter creeping ever closer to the magic one minute mark. Skye Cox improved her best times and rankings in her backstroke and freestyle events. Her time of 2m 24.63s was a best time by three seconds which was enough to secure her best age group placing with 10th spot. Skye was also close to breaking into the top 10 in the 50m freestyle and 100m backstroke. In the relays, the quartet of David Boles, Rocco Marsh, Theo Harvey and James Baldwin combined well. Their top placing came in the open 4x100m medley relay in which they finished 16th. Head coach Alastair Johnson said: "It has been a solid week from us. David has produced a standout series of hard racing that will put him in good stead for his open water season which starts in early January. "It was great to see young Theo Harvey rise to the occasion and produce a very good 1500m freestyle to take the bronze. The other team members all did well. They are still a young team which will go from strength to strength over the next few years." 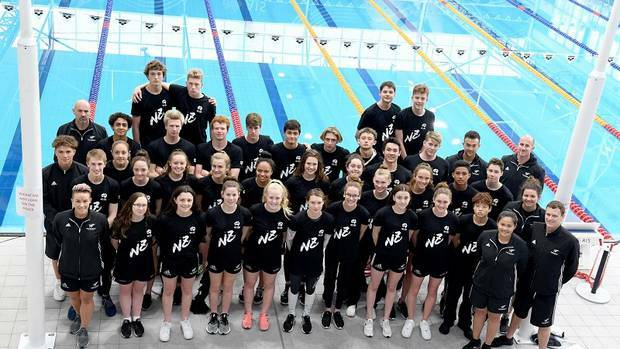 Meanwhile, 14-year-old Josh Balmer made his New Zealand international debut at the New Zealand-Australian State team competition held at the AIS in Canberra. Josh raced his heart out to post some cracking performances in his signature freestyle events. very fast 55.26s which was well under his best individual time of 57.11s. In his favourite 1500m freestyle, Josh was the second fastest Kiwi and smashed his best time with a 16m 40.72s effort which landed him in 12th place overall. was just outside his personal best. Johnson said Josh had "pretty much achieved his goals for this event". "Representing New Zealand is a tremendous honour and I know that Josh would have learned lots from his experiences in Canberra. I have no doubt that this will spur him on and he will be itching to push on and achieve more in the pool."